Not a problem. Shuttle was easy and very helpful drivers made it so. If you're looking for fast, cheap airport car parking, which doesn't compromise on security then JetParks 1 makes a great solution. This Park Mark Safer Parking-awarded car park is just 10 minutes from East Midlands Airport and offers round-the-clock transfers to the terminal. Transfers to the terminal building operate every 15 minutes, throughout the day. The transfer time is approximately 10 minutes. This car park is covered by CCTV and has regular security patrols. JetParks 1 is a holder of the Park Mark Safer Parking Award. All buses are DDA compliant and there are designated parking bays for Blue Badge holders. JetParks 1 is open all year, 24 hours a day. No height restrictions apply, however, trailers are not permitted. Follow the A453 for approximately 3 miles, going past the airport until you reach a roundabout. Turn right, then turn left on the next roundabout. Alternatively, on arrival at the airport main entrance, turn left at the roundabout and then follow signs for JetParks 1. Drive to the entrance where your number plate will be read and the barrier open - this may take up to 40 seconds. Head in and park your car in any marked space. Once parked, grab your bags and catch a shuttle to the nearby airport. If the barrier does not rise automatically, do not press the button for a ticket, instead call for assistance using the intercom button. 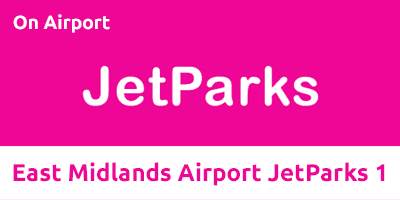 Make the short journey back to JetParks 1 on the free shuttle bus. Collect your car and drive to the exit barrier. Enter the ticket you were issued on arrival. The barrier will rise allowing you to continue your journey.